In an ambitious experiment in the Nebraska Grasslands, a Canadian scientist set out to comprehensively test Darwin's theory of evolution — from natural selection in the wild to functional genomics in the lab. We know natural selection in the wild occurs. There are any number of examples, including the famous example of white moths in industrial England in the 1800s that turned brownish-black with all the soot in the air. We also know mutations in DNA occur that can lead to new traits in species that get passed down from one generation to the next. But surprisingly, no one's ever studied all of it together before, until Dr. Rowan Barrett took on this challenge by studying mice in the Nebraska Sandhills. He'd never before studied these animals in the wild. "I really think that just my utter ignorance of working with mice before I came into the system is the only reason the experiment proceeded," said Barrett, now an assistant professor of ecological genomics at McGill University's Redpath Museum and the lead author of this study, who spoke with Quirks & Quarks host Bob McDonald. In the Nebraska Sandhills, there's light quartz sand that tends to host mice with lighter pigmentation and darker soils where mice with darker coats live. "The hypothesis is that this nice match between coat color and soil color is because the mice that are camouflaged (...) survived better," said Barrett. The other side of the story is that previous research had already identified a gene associated with variation in mouse coat colour. "So we have these sort of two parts of the equation and the tricky part was figuring out how to put them together," added Barrett. 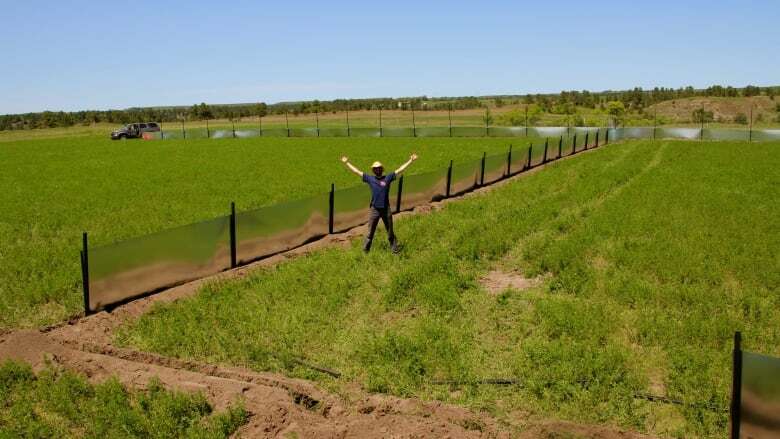 One of the biggest challenges for Barrett was finding a landowner willing to let him build 20,000-square-metre enclosures and populate them with wild mice for his experiment. "This is generally private land. And this is often quite fertile agricultural land," said Barrett. " And not everybody is going to be OK with some guy showing up on their doorstep and asking if they can conduct a mouse experiment on their land and construct mouse enclosures." He knocked on doors all over Nebraska, without any luck, until he serendipitously met a met at a bar in the town of Valentine in northern Nebraska who said Barrett could use his alfalfa fields. Barrett built his steel mouse enclosures on both light and dark soil, filled them with a mixture of light and dark mice from surrounding areas, and then let nature take its course. Just as predicted, very quickly Barrett found that light mice on dark soil and dark mice on light soil began to disappear, likely taken by avian predators. Then after analyzing the DNA of the mice left behind, Barrett said they were not only able to track the changes in the traits of the mice through time, but they also figured out what's going on at the genetic level. "What really caught our attention was one particular mutation was sort of hopping around saying, 'Pick me! Pick me! '," said Barrett. This mutation is strongly associated with the colour of the pigmentation on the backs of the mice. Barrett added, "What has always been a challenge is to show that this type of process works out in the fields with all of the messiness that goes on there, all of the complications, and interacting variables that you get in a wild environment," and connecting it to the genetics. "Actually demonstrating it has proven a real challenge." Do animals suffer from dementia?